THIS UNIT IS UNDER CONTRACT BUT IS CONTINGENT UPON FINANCING. SELLER AND POTENTIAL BUYERS HAVE AGREED TO SHOWINGS AND ENTERTAINING OFFERS. 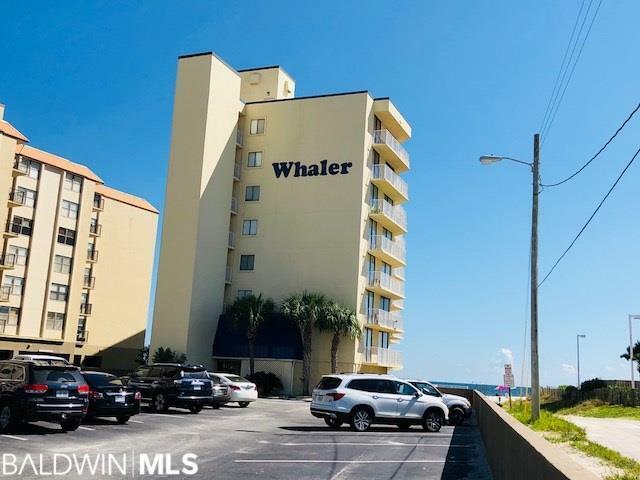 Every room in the condo has a great view of the Gulf from this 3 bedroom property at The Whaler, a low density complex in the heart of Gulf Shores! This unit comprises the entire south side of the complex..with amazing views of the Gulf, and with only 27 units in the entire building, the Gulf front pool is rarely crowded. This is a 5th floor unit, high enough to be away from the noise below, but low enough to be able to see everything happening on the beach. The unit is set up to sleep up to 10 guests, with a sleeper sofa and bunk beds. You couldn't ask for a better location, within walking distance of Gulf Place/Hang Out with it's beach activities and festivals, shopping & restaurants. Or walk to east and you can visit the Gulf State Pier, where you can enjoy the views and the fishing. Miles of walking and biking trails are nearby in the Gulf State Park. The condo has tile throughout, large galley kitchen with separate wet bar, granite in the kitchen and baths, jetted tub in Master bath and being sold fully furnished. Large balcony with access from the Master Bedroom and Living room. The interior was painted in 2015. Exterior of building was painted in 2016, concrete repaired under the building, and all new railings were installed on the walkways and balconies. No current assessments. New dryer in 2017, new built-in microwave in 2018. Seller's self manage this condo through VRBO (#398689) and have averaged $41,000 per year in rentals for the past 3 years. Expenses and repairs run, on average, $14,500, excluding mortgage. RENTALS 2018-$43,300. All rentals to convey at closing, if desired. Selling agent to confirm measurements.